Your electric future is coming. 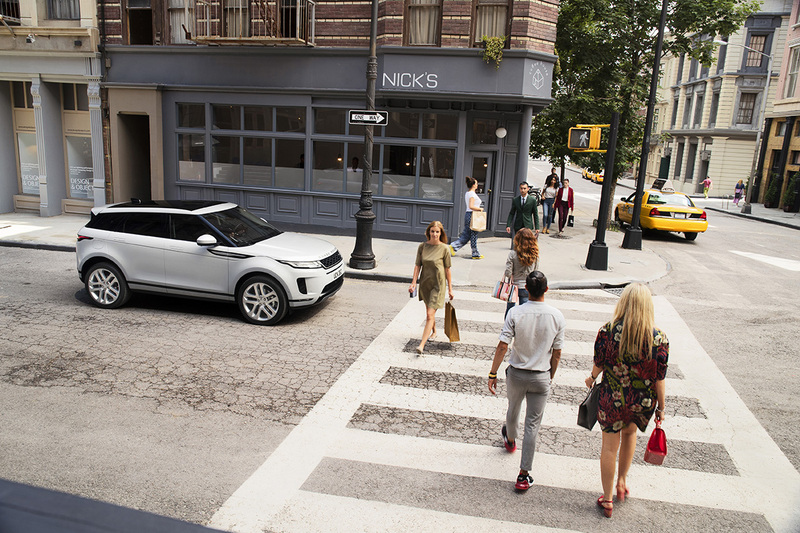 The new Range Rover Evoque uses battery technology to cut fuel consumption, reduce emissions and improve refinement – without you having to plug it in. It’s a hybrid car which is also known as an MHEV (Mild Hybrid Electric Vehicle). Cleverly it combines Land Rover’s efficient Ingenium petrol and diesel engines with a powerful underfloor battery so the engine can be turned off when coasting, braking, or stationary. New Evoque is Land Rover’s first mild hybrid. Its efficient electrified powertrain makes itan ideal SUV for driving in congested, stop-start city traffic. Cars switching off when stopped is nothing new. 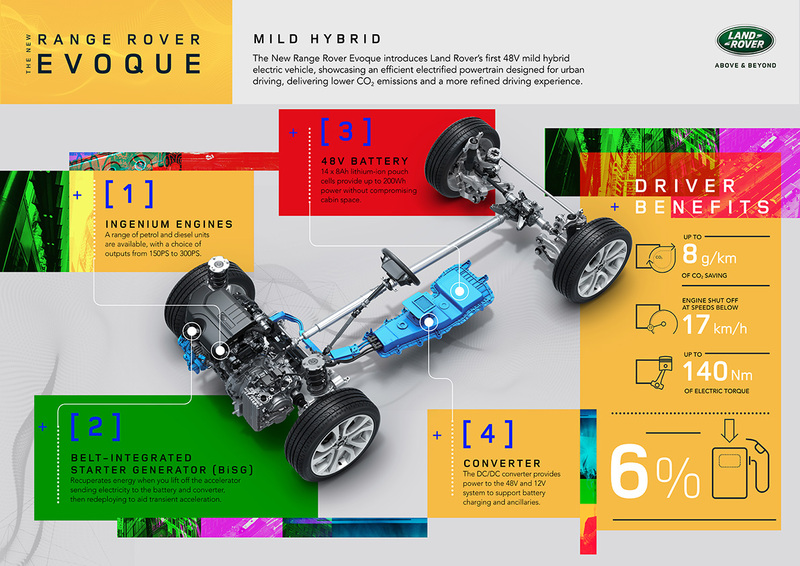 The Evoque MHEV moves the game on in a big way – it harvests the energy normally lost during deceleration and stores it in the underfloor battery. At speeds below 17km/h (11mph), while under braking, the engine will shut off to increase efficiency, restarting as soon as it’s needed. This technology reduces fuel consumption and tailpipe emissions, now as low as 50.4mpg (5.6l/100km) and CO2emissions of 149g/km (NEDC Equivalent)**. The compact luxury SUV’s 48V Lithium-ion battery can store up to 200wh of energy for the MHEV system without compromising cabin space. Separate from the normal vehicle battery, it generates up to 140Nm of torque to help acceleration. When the driver accelerates, this stored energy is redeployed to assist the engine. Electrification is central to future mobility solutions and mild hybrids are the first step on this path. An MHEV need never be charged and delivers real-world fuel consumption reductions that benefit almost all Evoque buyers. And for those customers who want silent Range Rover refinement, a plug-in hybrid model will be available within 12 months. New Evoque will be available from launch with the 48-volt mild-hybrid electric vehicle powertrain. This will be joined by a plug-in hybrid electric vehicle (PHEV) model in 2019. ** Official NEDC Equivalent (NEDCeq) Fuel Consumption for the Range Rover Evoque range in mpg (l/100km): Combined 5.4 – 8.1l/100km (52.3 – 34.9mpg). CO₂ emissions 143 – 186g/km. The figures provided are NEDCeq calculated from official manufacturer’s WLTP tests in accordance with EU legislation. For comparison purposes only. Real world figures may differ. CO₂ and fuel economy figures may vary according to wheel fitment and optional extras fitted.